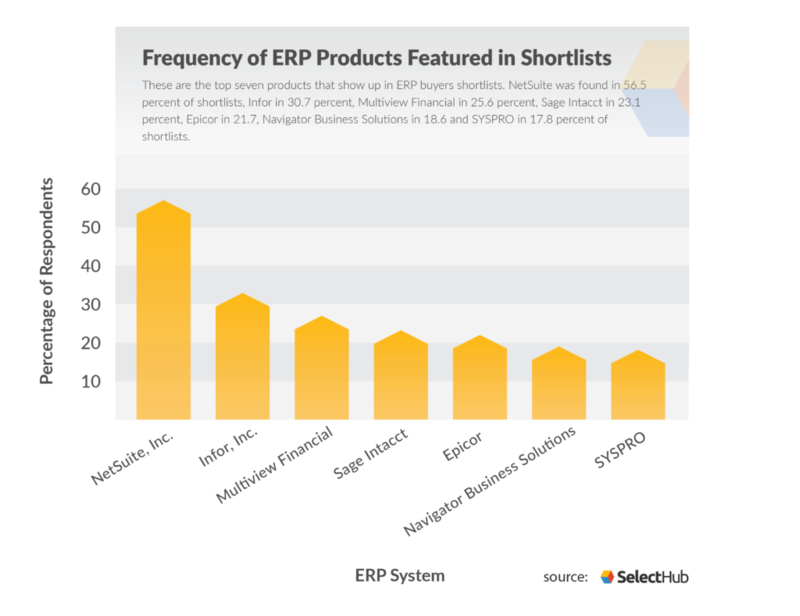 SelectHub is real people helping you find the top ERP software for your unique business needs while recognizing the best enterprise resource planning systems leaders who help make your decisions possible. ERP software solutions can provide a multitude of benefits to your company. From financial management to improved marketing to better integration, ERP systems can boost the productivity and efficiency of most if not all of your business functions. But this is only possible if you take extra time and care during your selection process. ERP systems provide improved insight into finances, increased efficiency, streamlined supplier management and effective customer relationship management. When implementing an ERP, keep in mind your budget, timeline, primary users, ROI and what resources you’ll need post-implementation. The level of capability an ERP system provides depends on its user experience, workflow design, reporting tools, its ability to freely share information and its implementation options. ERP providers should supply expertise in your industry, have a great professional services track record, be committed to their product, have platform stability and be experts in integration. There are specific questions to ask your vendor during demos and when you consider pricing. Make sure to prepare an exhaustive list of questions so there is no room for doubt before your company signs on with a vendor. ERP software provides a centralized platform through which an end-user can access a suite of applications. These applications are used to manage all aspects of business and are ideally fully integrated. The integration that an ERP provides allows applications to share the vast amounts of information an ERP can store. These aspects of ERP provide numerous benefits that other similar software systems cannot provide. ERP provides financial visibility, improved efficiency and intuitive customer and supplier relationship management. ERP systems are purpose-built to give you a company-wide view of accounting and financial data. Unifying accounts payable and accounts receivable into a single system that integrates to key process areas of a company delivers more insights than were ever available using accounting systems alone. ERP systems make it possible to track standard production costs and cost variances, along with making it possible to see how supply chain and services costs can be better managed. Getting a 360-degree view of accounting and financial performance is achievable with an ERP system, making your business easier to run and more efficient. The best ERP systems excel at integrating diverse workflows and business processes to deliver greater efficiency and control over company-wide strategies and programs. The ability to track production performance and its impact on profitability is possible with a scalable ERP solution. By reducing the time wasted on manual reporting, selling and production processes can shrink from weeks to literally hours. By integrating marketing, sales, production and finance workflows, ERP software systems are delivering a 360-degree overview of customers today. Knowing what customers have purchased in the past, what they’ll most likely buy and their pricing history all contribute to selling more in the future. ERP systems that can scale to support customer information also reduce order errors and track customer lifetime value with greater precision. Knowing who the best and worst suppliers are from a quality, pricing and schedule accuracy standpoint is indispensable in running a successful business. ERP systems are designed to track transactions with suppliers and provide insights into which are the best fit for your organization to purchase from. It is now possible to reduce supplier risk by having greater insight into vendor quality and delivery performance levels. As we’ll discuss throughout, ERP implementation is a lengthy and complex process. Around each corner is potential for hidden costs and opportunities for mistakes. However, if you keep a few goals in mind during implementation, you can avoid those mishaps. In order to maintain your implementation budget and timeframe, you need to set benchmarks. By breaking it up into smaller projects, it’s much easier to keep track of your progress. You can also ease some of the burden of the implementation process by choosing the right vendor. Some vendors are more committed to the implementation process than others. Choose the best vendor using the considerations later in the article. While researching, you need to keep the company’s best interest in mind but can’t forget the daily users. In reality, your employees will be dictating how much use your company actually gets out of the ERP. So make sure you choose a system with their input. Keeping ROI in mind will help you determine when it’s suitable to increase your budget or if you need to stick to your guns. It’s not necessarily wrong to spend more money during implementation, but you have to make sure it will pay off in the end. Think about how you want your company to look after you integrate your new ERP solution into your regular activities. There’s a list of questions to consider later in the article to guide you as you make these plans. As shown above, there are several major goals to accomplish while hunting down the right ERP software. The best way to accomplish these goals is to determine your business requirements. Creating a list of exactly what your business needs from an ERP system and vendor is necessary to determine where you will invest your IT budget. Transitioning from complex text-only interfaces with confusing commands to more intuitive, graphically driven screens, ERP systems’ user experience design and usability are improving rapidly today. In evaluating ERP systems for your company’s needs, evaluate potential vendors on how well they can provide a Microsoft Excel-like experience of using their applications. Intuitive navigation, easy UI customization, system-wide search and drag-and-drop graphics to create dashboards differentiate the most innovative ERP providers today. Lists pages developed by Microsoft Dynamics AX is becoming a standard user experience design element in many ERP systems today. Leading ERP providers are also making reports, charts, Key Performance Indicators (KPI) and embedded analytics and Business Intelligence (BI) all part of their configurable user interface options. These analytics options are being added to ERP systems’ user interfaces to provide users with the opportunity to drill down on data sets while keeping a contextual reference of their original report. Workflows are what change the most as your business grows. Evaluating ERP providers’ ability to support complex workflows and provide the agility and flexibility to change them anytime is essential. Evaluate providers based on their support of information retrieval as a process step that includes contextual functionality. These features provide for more complex, intelligent workflows that can scale faster across your company and deliver information that is more valuable. As a baseline, all workflow designs need to support alerts and notifications in addition to roles-based security to the file and application level. Reporting capabilities that can be launched from within any workflow save time and automate routine reporting tasks and are becoming more prevalent in ERP systems today. There are many other aspects of workflow design, making this area one that deserves attention and focuses during ERP system evaluations. All ERP systems today support dashboards and fundamental lists pages. It’s important to get beyond these fundamental financial and operations reporting features and determine which third-party reporting tools are also supported. Crystal Reports support is common, as is JasperReports. Advanced reporting systems also support aging analysis, Cash Flow analysis and budgetary reporting. Advanced ERP providers offer flexibility in defining custom metrics and KPIs for use on dashboards. Advanced ERP systems also support reporting for customer, product and supplier profitability as well. ERP providers’ main focus is often accounting and financials, but many also sell CRM, human capital management, manufacturing and distribution management, supply chain management, distributed order management, pricing, and service. Often ERP providers will acquire smaller companies that have applications and technologies they need to scale their application suite. It’s commonplace to find that an ERP providers’ applications share a sub-segment of data, especially if the applications are part of the suite as a result of acquisitions. Testing each application in the suite with unified workflows, determining inter-application integration support and if there is a single data model are all essential steps to take before purchasing a suite of ERP applications. According to the latest market share data from International Data Corporation (IDC) and Gartner, one in five ERP systems being sold today is cloud-based. IDC predicts this will double in the next three years. Implementation options for cloud-based ERP systems are relatively simple and straightforward and include educating users about how they can best use the system to do their jobs. Integrating cloud-based ERP systems with third-party legacy systems are where implementation options including Application Programmer Interfaces (API) become a priority. Often, cloud-based ERP providers will rely on third-party services firms to also provide integrated software and support. There are many ERP systems sold today that run on stand-alone servers. Implementation options for these systems include Linux, Unix and Windows integration expertise to the operating system level. Evaluate ERP providers’ expertise with the operating system, server, database integration and support for legacy ERP integration, specifically SAP R/3 instances which are prevalent in larger enterprises. In addition to the basic features ERP systems provide, there are a few key factors you need to consider when evaluating your software options. For many companies selecting an ERP system is the most expensive IT decision they will make. The most important criteria to use in narrowing down your company’s list of ERP software providers is previous experience and expertise in your industry. There’s no one-size-fits-all ERP system that can scale to the nuances and unique requirements of your business. Therefore, you need to find the ERP software providers who understand the unique needs and nuances of your industry. A vendor should translate these subtleties into an ERP system that delivers you a competitive advantage. In selecting an ERP software provider, find those who have a successful track record of translating your industry’s specific needs into scalable features.  Second, see if there are any customer references you can speak with in your industry and arrange calls with them. Interpreting specific business and strategy requirements then translating them into a reliable, scalable ERP system that can flex and grow as your business does is what ERP providers’ professional services teams do. Professional services implementation costs for small to mid-size implementations cost between two to four times the cost of software alone. When evaluating an ERP software provider, get a call scheduled with VP of Professional Services and find out which customers are going live soon and which are already launched that are most like your business. What’s the average length of time it takes for a project to go live? What is their approach or methodology to ensure customers’ needs are included in system design to the screen level? Can customers manage the user interface or does everything have to go through professional services? Be sure to get these questions answered at the onset to make sure expectations are on the same level with ERP providers you are evaluating. The ERP providers that deserve to be on your shortlist are making ongoing investments to improve the usability of their applications and improve the overall user experience. ERP systems are known to be the most challenging to learn and use, and with the emphasis on user adoption driving today’s ERP providers’ business models, improving usability is critical to their growth. Finding out how committed the ERP providers you’re evaluating are to delivering excellent usability starts with demos and progress to seeing actual, live customer implementations. Ask to see the last three versions of the ERP system to see if there is progress being made on the user interface and navigation. Ask for and get product demos that illustrate how the ERP systems you’re evaluating complete the top five workflows most important to your business. For an excellent overview of this and other aspects of the challenges of implementing ERP systems please see the working paper, Challenges in Implementing Enterprise Resource Planning (ERP) system in Large Organizations: Similarities and Differences Between Corporate and University Environment from the MIT Sloan School of Management. Early in your review cycle of ERP providers, find out which platform(s) they support and are planning to. Finding this out will help to plan your ERP internal roadmap, ensuring no interruption to your business when platforms change, or new ones are introduced. ERP providers are actively competing against each other to deliver the richest set of application functionality, integration options, usability enhancements and performance improvements. When evaluating ERP providers ask to see the platform roadmap. Be sure to also ask if the platform is based on proprietary code or an open architecture that scales to support expansion as your business changes and grows. The bottom line is that the platform strategy must allow for scale and speed while remaining flexible to your company’s changing information needs. Look for ERP providers who have a proven track record of excelling at integrating their system with third party platforms, systems and applications. Integrating with legacy systems is the most challenging area of this requirement, so be sure to ask for customer references where the ERP providers you are evaluating have completed this level of integration. Additional questions to ask include how much experience the ERP provider has with accounting & finance, cloud, CRM, database, purchasing and diverse third-party system integration. Find out in detail how these were completed and see how these integrations are performing from an accuracy and speed standpoint. No two ERP systems will perform the same for your business. Make sure to do as much research as possible into how exactly an ERP solution can enhance your business functions. Ask friends at other companies what they use and how it’s useful. Keep in mind how your businesses are similar and how they’re not. Understand how your current ERP is lacking or even how it’s being underutilized. Once you get an overall idea of the kind of system you’re looking for, it’s time to jump into software comparison lead by data. Our in-depth ERP comparison matrix is an interactive tool you can use to compare market leaders based on their functionality. Our analyst team has evaluated and ranked the top systems based on how well they fulfill features like the ones above. ERP selection is an extensive process, but it’s only worthwhile if you’re meticulous along the way. SelectHub provides buyers with numerous tools to make the software selection process a little less arduous. We manage the software requirements for thousands of companies and through this have been able to compile data on ERP vendor shortlists. From a sample of over 700 companies, we can see how often top vendors make it into buyers’ shortlists. Selecting an ERP system for your company needs to reflect how unique and differentiated your business is. There are hundreds of ERP providers selling systems today. Knowing which ERP providers excel in your industry will help to gain greater insight and context into who needs to be on your shortlist. Fortunately, SelectHub is here to help. Do you have any workflows that highlight my industry’s unique challenges? The most important criteria for evaluating any ERP provider is whether they have previous experience with your industry’s specific requirements and unique needs. Be sure to ask for examples of customers who are live today using their software to solve comparable industry challenges. What advanced financial reports does your system provide? The better ERP systems will support aging accounts receivable and accounts payable analysis, multi-site financials, price analysis and the ability to rank customer and supplier profitability. Just providing dashboards is not enough; the highest performing ERP systems today have the ability to do advanced financial analysis based on operations-driven data. Why do sales teams need to have reports from the ERP system? Sales can easily run reports to find out which customers’ orders shipped, which are in backlog and which are just getting started by production. Having this information at their fingertips give them the ability to serve customers more effectively, while upselling new products and services. In advanced ERP systems, sales management can see what pricing programs are working the best and also collaborate with marketing on new selling strategies, immediately seeing what’s working or not. When you can combine information from different areas of the business, you can analyze factors like how the latest marketing campaign affected sales and whether you had enough inventories to support that growth. This can also help you forecast growth and tailor protocol to the way you predict the company will operate in the future. If you’re investing in an ERP solution, you don’t want it to be obsolete in a year. Plan to implement software that will last at least ten years. ERP should be scalable. Find out what the limitations are on the scale and reporting capability of your system so you can make an adequate decision about whether the software is right for you. Enterprise Resource Planning (ERP) systems pricing is going through a revolutionary shift today, away from perpetual licensing to subscriptions and maintenance, to pricing strategies that capitalize on cloud computing’s core strengths. Many long-standing ERP system providers urgently need to transition from perpetual licensed-based revenue to subscriptions and maintenance as their on-premise customers migrate apps and workloads to cloud platforms. For many ERP system providers, their on-premise revenue is dwindling as long-standing customers abandon on-premise systems for cloud-based platforms that offer superior economic advantages. These disruptive forces revolutionizing the ERP landscape work to the advantage of system buyers today. Given how future revenue streams for ERP providers are entirely dependent on the pricing frameworks, strategies and programs they put in place today, ERP system buyers can define pricing terms to their advantage. Every ERP provider has a series of pricing models that vary by the customer segments they sell into and profit goals by product and region. All ERP providers rely on a series of pricing models and selectively present them to potential customers based on their needs, preferences, hardware prerequisites, geographic location and modules needed. The most common foundation of these pricing models is perpetual pricing, which is the first one many of the ERP providers began with. Perpetual pricing involves a large up-front fee to purchase the rights to use the ERP systems indefinitely. Annual maintenance contracts can range from 15 percent to as high as 25 percent of the purchase price of the software. Many companies choose to outsource maintenance to third-party companies instead of paying larger ERP providers this maintenance fee. Given how urgently ERP providers want to move from on-premise to cloud revenue sources, bargaining for a lower maintenance fee is possible and is being accomplished by many customers buying systems today. ERP pricing strategies began with perpetual pricing and have since moved on to per-resource models in addition to the fast-growing subscription-based approaches to generate greater maintenance revenues. Fixed fee or perpetual licensing is most prevalent for on-premise ERP systems, while package pricing spans both on-premise and Cloud-based systems. It is common to see ERP pricing models that include Per CPU, Per Seat, Per User, Per User/Per Year and value-based pricing. Minimize add-on customizations of an ERP system and take a best-fit approach to trim pricing by as much as 10X. The largest providers of ERP systems charge between four and ten dollars for every one dollar spent on software to complete customization of core ERP components and modules. Selecting the best-fit of ERP systems for your company’s needs and reducing or eliminating customizations will significantly reduce the overall price. Subscription pricing is becoming more commonplace as Cloud-based ERP vendors provide many variations on this pricing approach making their applications affordable for small businesses. Of the many pricing strategies today, subscription-based is the fastest growing and the one with the greatest variation of options for companies. The most common forms of subscription pricing include an initial set-up fee and a monthly charge for the applications used by a business during the month. Variations on the model include value-based and transaction-based pricing. Value-based pricing tracks the costs savings an ERP application generates through an agreed-upon approach between the vendor and customers. Transaction-based pricing tracks how many exchanges there are of payments for products, services and coordination across suppliers and buyers. The level of customization, applications or modules required, total user count, the number of geographic locations, anticipated transaction level and platform all have a significant impact on ERP system pricing. All of these factors will impact the pricing for an ERP system with the anticipated transaction level influencing both the scalability of the system and potentially its price if a per-transaction pricing model is used. Add to this if the ERP system is hosted or on-premise and the pricing model will change to reflect licensing versus maintenance charges. Change management costs can often become nearly as much as the ERP system itself, including consulting, training and redefining process workflows. ERP software itself is often the least expensive cost component of an implementation, with the many costs associated with change management being the majority of the price. It’s important to plan and budget for a change management strategy that includes training, customization of screens and usability improvements and ongoing consulting to make sure those using the system get the most value from it. Change management strategies also need to be in place before a new system is purchased and installed for its full value to be realized. When budgeting for a new or replacement ERP system there are five key costs that need to be defined as part of the original budget. For on-premise ERP systems it’s important to have a budget in place for the hardware or infrastructure, IT staff costs, implementation and customization, maintenance, and the actual software license. ERP system providers will often initially quote a perpetual license if you are interested in an on-premise system. It’s best also to ask for a per-transaction and per seat estimate as well to see how you can get the best possible price. For cloud-based ERP systems, the two largest costs will be subscription fees and implementation or customization. One major cost component to also think about is the integration between the ERP system and existing databases and third-party systems in your company. With on-premise systems, this will require customization. With cloud-based systems, there may be Application Programming Interfaces (APIs) available to enable integration. Choosing an ERP system provider is a task that should be given serious consideration. This ERP system comparison is meant to be used as a starting point to guide IT professionals who are tasked with making this decision. Epicor ERP 10 is user-friendly and provides an ERP system that's designed to lift business results and empower users. As part of a modern service oriented architecture, this key ERP solution helps to manage things like supply chain handling and supply chain management, as well as each individual business process that contributes to industrial or product development workflows. Kechie ERP is the leading cloud-based solution that eliminates the cost of having traditional capital equipment expenditures such as in-house server. It is designed for quick implementation, easy training, and intuitive ease-of-use so you can put it to work solving your critical business management problems very quickly. Kechie is the Most Customizable solution on the market, where our motto is, "Kechie adapts to you and your business, not the other way around. "Kechie ERP helps streamline your business needs by automating and synchronizing your: supply chain, manufacturing, procurement, multi-warehouse management, CRM, finance, and sales order management all integrated together into one easy to use solution. The VeraCore Fulfillment Solution is designed to be at the “core” of your fulfillment business. More than just pick and pack software, VeraCore is a complete fulfillment solution that combines robust order management software with a powerful warehouse management system. VeraCore’s deep capabilities and flexible design will meet all your clients’ needs and ensure healthy margins in your business. Apprise® ERP is a fully-integrated, enterprise-wide solution designed specifically for the consumer goods industry – built to fit the needs of importers and distributors that market or manufacture fast moving consumer goods (FMCG) such as toiletries and cosmetics, non-durable goods such as food, wine and apparel, or durable goods like electronics and home furnishings. Our market niche is focused on financials only and spans all three market segments: small, medium and large enterprise organizations. Multiview clients reside in over 40 industries, with many being listed on one of the major north american stock exchanges (nyse, nasdaq, amex or the tsx). Multiview is a unique supplier in this market because our products are industrial strength with enormous functionality and the ability to handle large transaction volumes, yet very affordable. Our goal and motivation is the successful implementation of our products. Over time, we have established ourselves as a premier solution for small, medium and enterprise organizations looking for quality software and a supplier who can execute. Our forte is superior reporting! Multiview has, with our viewpoint reporting environment, a single tool that offers: financial, bi analytics, ad hoc reporting inquiry all driven by a point and click/drag and drop interface. Over 9,000 customers are moving their organizations forward with Sage Intacct’s best-in-class ERP financials. How can we help you? By automating your accounting processes, so you can stop worrying about merely keeping up with growth. And increasing your total business visibility, so you can start deciding how to drive growth. Why? Because Sage Intacct is 100% invested in meeting the needs of the finance team, 100% focused on customer success, and 100% committed to the cloud. That’s who we are, and always will be. Grow better every day with Sage Intacct. Unit4 Business World On! is a cloud ERP solution that enables service-centric organizations in the public and private sectors to gain a significant advantage over their peers. Its leading-edge architecture facilitates faster innovation at a lower cost and with less disruption. The result is more opportunity and smarter operations. Sage Live is an integrated cloud accounting solution. Sage has created a next generation cloud accounting solution that empowers small and medium businesses to achieve their ambition by reducing the time spent on low-value tasks. By offering full integration with Salesforce and thousands of other business apps, Sage Live enables businesses to benefit from a single real-time source of information so they can manage efficiently their business. FinancialForce Professional Services Automation (PSA) is a cloud based services solution that leverages the power of Salesforce CRM and Force.com to manage your people, customers, projects and financials in one integrated services management application. See the Price/User for the top ERP Software… plus the most important considerations and questions to ask when shopping for ERP Software.